We have collected and analyzed 73 user reviews from international sources. Users rate it 85/100. The average review date is Jun 12, 2014. We have compared these reviews to 367686 reviews from other Camcorders. The alaScore™ for this product is 84/100 = Very good. 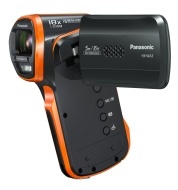 Last update: Apr 18, 2019.
alaTest has collected and analyzed 73 user reviews of Panasonic HX-WA03 from Amazon.com. The average user rating for this product is 4.2/5, compared to an average user rating of 3.9/5 for other Camcorders on Amazon.com. People really like the size and design. The portability and price also get good comments, but many are less positive about the memory and viewfinder.